Families in Bakersfield, CA love to spend outdoors, and what better way than a friendly game of golf? Southwest Greens of Bakersfield proudly installs the best synthetic putting greens on the market for backyard and indoor applications. Our practice golf greens can be modified to fit any space from a small tee line to a full putting paradise. We can give you a superior golf practice area that’s made to last for years. How Are Your Backyard Putting Green Materials Made? 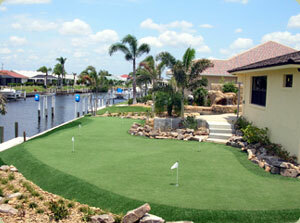 We use the highest-quality artificial turf for our putting green builds. They feature the top quality 7600 denier polypropylene synthetic grass fibers for a durable, lifelike putting experience. Southwest Greens trains all locally owned and operated installers to use an integrated design process inspired by Jack Nicklaus’ golf green designs. We use the very principles and templates provided by our partnership with Nicklaus Design to give you the best putting experience in your backyard or inside your home. Your custom putting space can be designed to flow naturally around a backyard pool or to incorporate a children’s play area. The flexibility of our personal designs allows you to build a green that fits your space, your family’s needs, and your budget. Not only will you get the best synthetic turf on the market, but you’ll also get a surface that is safe for your family and your pets! We don’t use harsh chemicals or ask you to use fertilizers with our turf and grass. It’s really a worry-free putting green lawn! Mark Swaim is the local owner of Southwest Greens in the Bakersfield area, and he and his team have been installing synthetic grass putting greens and landscapes since 2007. Schedule a free on-site consultation with Mark to learn more about having a custom practice golf green installed at your home!